Some of us will readily admit that gluten-free baking can be a chore, sometimes you only have energy for a frozen pizza. Lately, that’s becoming a little bit more available to the gluten-free crowd. Garlic Jim’s has a new line of pizzas that look good, inside and out. 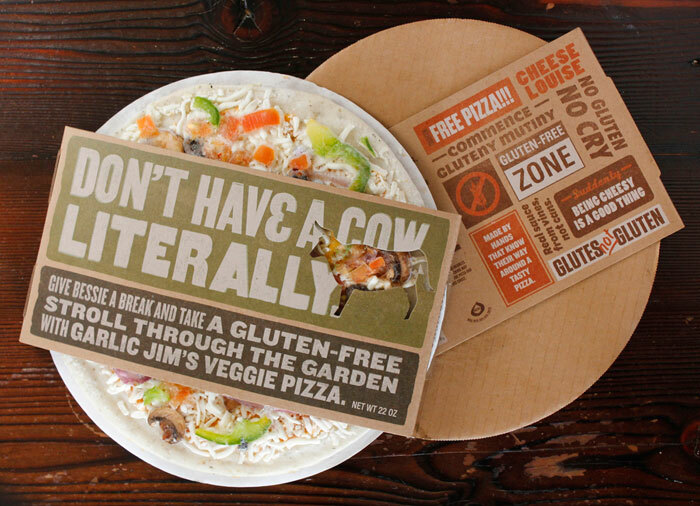 As one of the first gluten-free pizzas within mainstream retailers, Garlic Jim’s wanted to initiate a conversation with potential consumers on-shelf. Hornall Anderson took this direction and ran with it. Instead of doing the typical front of pack “beauty” shots of pizza that consumers are used to seeing when shopping the frozen pizza aisle, Hornall Anderson used an editorial tabloid-style approach on the packaging. Representing the “gluten-free movement” for those required and those choosing to make a healthier choice, the packaging design uses humorous slogans and tongue-in-cheek messaging that places emphasis on “owning” and “embracing” the gluten-free pizza, rather than being apologetic for it. 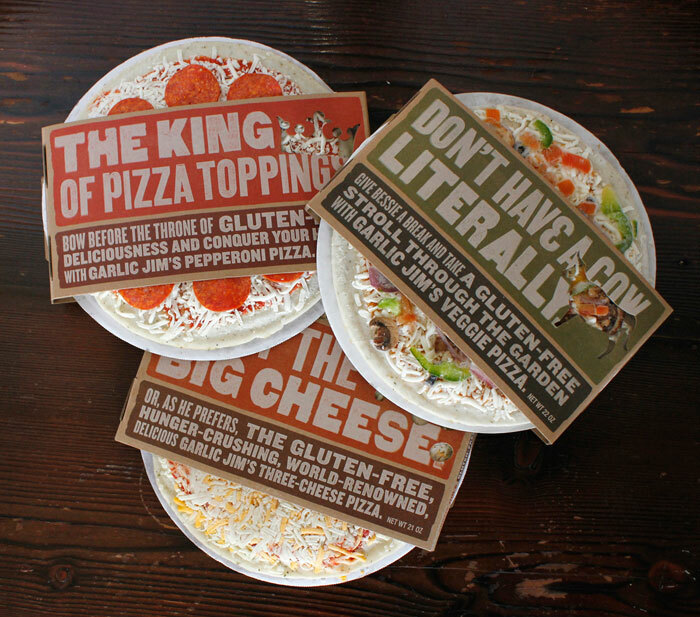 the packaging design uses humorous slogans and tongue-in-cheek messaging that places emphasis on “owning” and “embracing” the gluten-free pizza, rather than being apologetic for it. This entry was posted in Baking, Cooking, Culture, Health, Ingredients, Labeling and tagged frozen pizza new, Garlic Jim's, Garlic Jims gluten free, gluten free frozen pizza, gluten free pizza on December 28, 2011 by glutenfreepdx.